Unfixed frozen tissue samples embedded in Optimal Cutting Temperature medium (OCT) can be used to study natural distribution and glycosylation of secreted mucus. In this approach tissue processing is minimal and the natural presentation of glycolipids, mucins and glycan-epitopes is preserved. 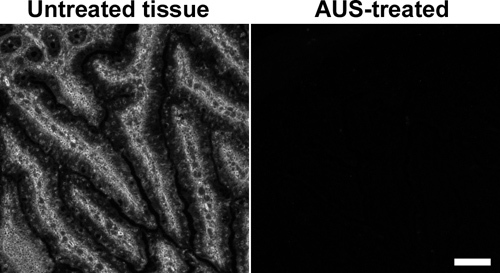 Tissue sections can be analyzed by immunohistochemistry using fluorescence or chromogenic detection. Cohen, M., Varki, N. M., Jankowski, M. D., Gagneux, P. Using Unfixed, Frozen Tissues to Study Natural Mucin Distribution. J. Vis. Exp. (67), e3928, doi:10.3791/3928 (2012). Mucins are complex and heavily glycosylated O-linked glycoproteins, which contain more than 70% carbohydrate by weight1-3. Secreted mucins, produced by goblet cells and the gastric mucosa, provide the scaffold for a micrometers-thick mucus layer that lines the epithelia of the gut and respiratory tract3,4. In addition to mucins, mucus layers also contain antimicrobial peptides, cytokines, and immunoglobulins5-9. The mucus layer is an important part of host innate immunity, and forms the first line of defense against invading microorganisms8,10-12. As such, the mucus is subject to numerous interactions with microbes, both pathogens and symbionts, and secreted mucins form an important interface for these interactions. The study of such biological interactions usually involves histological methods for tissue collection and staining. The two most commonly used histological methods for tissue collection and preservation in the clinic and in research laboratories are: formalin fixation followed by paraffin embedding, and tissue freezing, followed by embedding in cryo-protectant media. Paraffin-embedded tissue samples produce sections with optimal qualities for histological visualization including clarity and well-defined morphology. However, during the paraffin embedding process a number of epitopes become altered and in order to study these epitopes, tissue sections have to be further processed with one of many epitope retrieval methods13. Secreted mucins and lipids are extracted from the tissue during the paraffin-embedding clearing step, which requires prolong incubation with organic solvents (xylene or Citrisolv). Therefore this approach is sub-optimal for studies focusing on the nature and distribution of mucins and mucus in vivo. In contrast, freezing tissues in Optimal Cutting Temperature (OCT) embedding medium avoids dehydration and clearing of the sample, and maintains the sample hydration. This allows for better preservation of the hydrated mucus layer, and thus permits the study of the numerous roles of mucins in epithelial biology. As this method requires minimal processing of the tissue, the tissue is preserved in a more natural state. 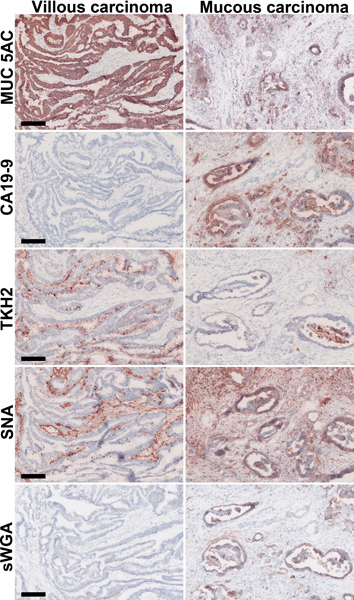 Therefore frozen tissues sections do not require any additional processing prior to staining and can be readily analyzed using immunohistochemistry methods. We demonstrate the preservation of micrometers-thick secreted mucus layer in frozen colon samples. This layer is drastically reduced when the same tissues are embedded in paraffin. We also demonstrate immunofluorescence staining of glycan epitopes presented on mucins using plant lectins. The advantage of this approach is that it does not require the use of special fixatives and allows utilizing frozen tissues that may already be preserved in the laboratory. Prepare a freezing bath by adding dry ice to 2-methyl butane in a shallow Styrofoam box. Harvest the tissue, and gently damp on a tissue paper to dry excess liquid. If using snap-frozen tissue (tissue that was frozen in liquid nitrogen), allow the tissue to warm up to -20 °C by placing it in a cryo-microtome chamber. Add a small amount of OCT to the Peel-A-Way freezing mold, just enough to cover the bottom of the mold. Place the tissue in the mold, make sure the tissue is rested on the bottom of the mold at the desired orientation. Once frozen, the tissue block will be sectioned either from the bottom or from the sides. Cover the tissue with OCT, and place the mold in the freezing bath. The OCT compound will turn white as the tissue freezes. Once frozen, peel the mold off the frozen block and place in a marked freezing bag. The frozen blocks can be kept at -80 °C until use. Place tissue blocks in the cryo-microtome chamber, and allow them to reach -20 °C (about 30 min). Cut a 3-5 μm thick section, and place a positively charged glass slide on top of the section. The tissue will adhere to the slide. Air dry the tissues for 30-60 min. The slides can be used at this stage, or they can be kept at -80 °C for future use. Slides that were stored at -80 °C: allow the slides to thaw and air dry at room temperature for 30 min. Fix the slides with 10% buffered formalin for 30 min at room temperature. Wash three times in PBS or TBST buffer, for each wash dip the slides 10 times in 250 ml buffer. PBS buffer can be used for immunofluorescence staining, however, for chromogenic detection with Alkaline Phosphatase-conjugated antibody, TBST should be used since the phosphate in PBS inhibits Alkaline Phosphatase activity. Tissue sections slides are now ready to be stained. Rinse the slides in water, incubate in 3% acetic acid for 3 min at room temperature. Stain with Alcian Blue pH 2.5 solution for 30 min at room temperature. Wash the slides in running tap water for 10 min, rinse in DI water. Counterstain in Nuclear Fast Red for 5 min at room temperature. Wash slides three times in DI water. Rinse the slides in water, incubate in freshly prepared 1% periodic acid for 5 min. Wash three times in DI water, dip once in miliQ water. Stain with Schiff reagent for 15 min at room temperature. Counterstain in Surgipath Hematoxylin for 30 sec at room temperature. Incubate slides 30 sec in scott's tap water at room temperature. Wash three times in DI water. Dehydrate and clear slides by incubating 1 min in 95% ethanol, followed by three quick changes in 100% ethanol, and three changes in Citrisolv, 2 min each. All at room temperature. Mount slides on coverslips with resinous medium (Cytoseal 60). For fluorescence detection of three glycan epitopes using lectins, block the slides with 1% BSA in PBS for 10-30 min at room temperature. Since a biotinylated lectin is used, block endogenous biotin by incubating 15 min with 0.1% Avidin, followed by 15 min incubation with 0.01% biotin at room temperature. Wash the slides in PBS after each blocking step. Freshly prepare a mixture of 1 μg/ml Rhodamine-conjugated succinylated wheat germ agglutinin (sWGA), 1.3 μg/ml biotinylated Sambucus nigra agglutinin (SNA) and 5 μg/ml Fluorescein-conjugated Jacalin in HEPES/NaCl buffer (10 mM HEPES, 150 mM NaCl pH 7.5). Place slides on a flat surface or in a staining box, and layer the lectin mixture on top. The mixture volume can be reduced by gently placing parafilm on the liquid, the parafilm flattens the liquid and prevents evaporation. Incubate 1 hr at room temperature in dark. Wash slides three times with PBS. Layer slides with 0.7 μg/ml streptavidin-conjugated CY5 (to detect the biotinylated-SNA), and incubate for 30 min at room temperature in dark. Counterstain nuclei with 0.1 μg/ml DAPI. Mount slides on coverslips with aqueous medium such as VectaMount mounting media (or any aqueous media). Lectin staining specificity is controlled either by specific enzymatic cleavage of target glycan epitope prior to staining or by competition with small molecules. Dilute Arthrobacter ureafaciens sialidase (AUS) to 250 mU/ml in 50 mM sodium acetate pH 5.5. Add water to the bottom of an empty tip-box, this will form a humid chamber during incubation. Place slides face up on the top tray of the tip-box, layer 150-200 μl AUS solution on the slide and cover with a coverslip. Avoid air bubble formation. Close the box lid and incubate at 37 °C for 2.5 hr. Wash slides three times in PBS at room temperature to remove all free sialic acids. These slides should be negative for SNA staining. Aliquot 200 μl of the lectin mixture prepared in step 5.4 to two Eppendorf vials. Add 200 mM Melibiose (Jacalin inhibitor) to one of the vials and Chitin-hydrolysate at 1:10 dilution (sWGA inhibitor) to the other vial. Overlay negative control slides with the inhibitors-containing mixture and incubate 1 hr at room temperature at the same time as the rest of the slides. These slides should be negative for Jacalin or sWGA staining, respectively. A comparison between tissue samples embedded in paraffin to frozen tissues embedded in cryo-protectant media (OCT) revealed striking difference in the preservation and quality of staining for mucin glycoproteins. Tissue staining with histochemical dyes, such as Alcian Blue and Periodic Acid Schiff, produce very different results in comparable tissue sections from frozen or paraffin embedded samples (Figure 1). It appears that the organic solvent (xylene or Citrisolv) that is used during the paraffin embedding process affects the distribution of secreted mucins on epithelia as well as removing much of the glycolipids from the samples (Figure 2). As a result, the mucus layer appears collapsed on the mucosa cells and is mostly found in goblet cells. Flash freezing of tissues in cryo-protectant media (OCT) maintained sample hydration and preserved the secreted mucins layer dimensions. The paraffin embedding process affected other mucus-associated glycans and glycolipids in a similar way. Glycan distribution was examined using lectins, which are routinely used for glycan detection (Figure 3) and antibodies against epitopes found on mucins and glycolipids (Figure 6). Because lectin binding is not well defined and is affected by the spatial distribution of glycans as well as the glycan structure14,15, it is important to apply the appropriate controls for lectin staining. Here we demonstrate two methods for controlling lectin staining on the tested tissues: enzymatic cleavage and competitive inhibition. Cleavage of the glycan epitopes was done by digesting the tissue section with glycan-specific enzymes, for example bacterial sialidase as control for sialic acid binding by SNA (Figure 4). In cases where specific enzyme (e.g. glycosidase) is not available for removing the glycan epitope studied, lectin specificity can be confirmed by adding a competitive inhibitor such as Melibiose for Jacalin staining or Chitin-hydrolysate for sWGA staining (Figure 5). We demonstrate here that snap-frozen tissue samples, which are routinely obtained in the clinic and in research laboratories, can be further embedded in OCT and used to study mucin glycoproteins and the many glycans present on them. Abbreviations: Ab, antibody; Sia, Sialic acid; Gal, Galactose; GalNAc, N-acetylgalactosamine; GlcNAc, N-acetylglucosamine; Fuc, Fucose; STn, Sialyl Tn; SLea, sialyl Lewisa; SLex, sialyl Lewisx. * Commercial sources for MAA include MALI, MALII & MAH. Table 1. A partial list of lectins and antibodies for glycan epitopes. Figure 1. Alcian Blue and Periodic Acid Schiff staining of frozen and paraffin-embedded colon tissues. Tissue sections of human, mouse or chicken colon specimens frozen in OCT (upper panel) or embedded in paraffin (lower panel) were stained with Periodic Acid Schiff (PAS) or Alcian Blue (AB). These reagents stain mucus pink or blue, respectively. Upper panel: In frozen tissues, in addition to mucins in goblet cells, secreted mucus was also visible (arrows). Lower panel: In paraffin-embedded tissues, mucus staining was confined to goblet cells. Nuclei were counterstained with Surgipath (PAS) or Mayer's (AB) Hematoxylin. Scale bar indicates 100 μm. Click here to view larger figure. Figure 2. Citrisolv incubation results in substantial loss of mucins. Serial sections of frozen chicken ileum specimens were fixed in 10% buffered formalin and kept hydrated (left panel), dehydrated in ethanol by sequential incubation in 70%, 90% and 100% ethanol for 20 min each (middle panel), or dehydrated in ethanol and cleared with Citrisolv for 1 hr (right panel). Dehydrated samples were rehydrated back to PBS before Hematoxylin and Eosin (H&E) or Alcian Blue staining. Ethanol dehydration and Citrisolv clearing improved tissue morphology (e.g., top row, middle and right images versus left image). Ethanol dehydration had no significant effect on Alcian Blue staining (middle row, compare left and middle images). In contrast, Citrisolv incubation reduced Alcian Blue staining and confined it to goblet cells (middle row, right image) in a pattern that was similar to that seen in paraffin-embedded tissues (Figure 1). These data imply that the strong staining of mucus granules in paraffin-embedded samples is due to shrinking and condensing of mucus in the goblet cells during the clearing step. The fainter and less dense staining of mucus in frozen OCT-embedded tissues reflects a more natural distribution of mucus in the tissue. Higher magnifications of boxed areas are marked with arrows. Scale bars indicate 50 μm (top and middle rows) and 10 μm (bottom row). Figure 3. Binding of lectins to glycan epitopes on frozen and paraffin-embedded tissues. Chicken small intestine (ileum) specimens frozen in OCT (upper panels) or embedded in paraffin (lower panels) were probed with Jacalin (blue), sWGA (green) and SNA (red). Higher magnifications of boxed areas are marked with arrows. In frozen tissues Jacalin binding to O-linked glycans revealed structures that appeared to be oozing from goblet cells into the lumen (Jacalin, upper panel, arrows). 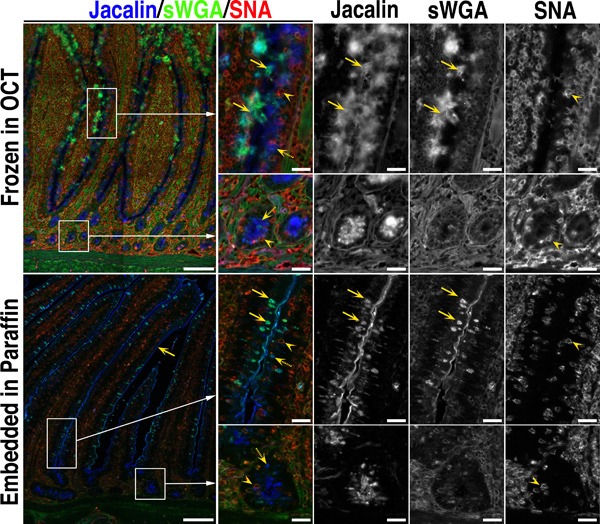 In contrast, Jacalin binding to paraffin-embedded tissues was confined to goblet cells (Jacalin, lower panel, arrows) and to the villi brush border (bottom left image, arrow). sWGA staining of β1-4GlcNAc partially co-localized with the binding of Jacalin lectin in both frozen tissues (upper panel, arrows), and in paraffin-embedded tissues (lower panel, arrows). In contrast, SNA lectin binding to α2-6 linked sialic acids is intracellular (SNA, arrowheads), and does not co-localize with Jacalin (color image, SNA in red marked with arrowhead, Jacalin in blue marked with dotted arrow). Scale bars indicate 100 μm (left images) and 20 μm (magnified boxed areas). Figure 4. Enzymatic cleavage control for sialic acid staining with SNA. Chicken small intestine specimens were incubated with 250 mU/ml Arthrobacter ureafaciens sialidase (AUS) or with 50 mM sodium acetate pH 5.5 buffer for 2.5 h at 37 °C. AUS treatment abolishes staining with biotinylated SNA, confirming SNA binding specificity to sialic acids. Scale bar indicates 100 μm. Figure 5. Competitive inhibition control for glycan staining with Jacalin and sWGA. Chicken small intestine (ileum) specimens were incubated with a Jacalin and sWGA mixture in the presence of specific lectin inhibitors: Melibiose (middle column), Chitin-hydrolysate (right column) or without inhibitor (A and D). Upper panel: (left) Jacalin staining without inhibitors. (center) Jacalin staining was inhibited by Melibiose. 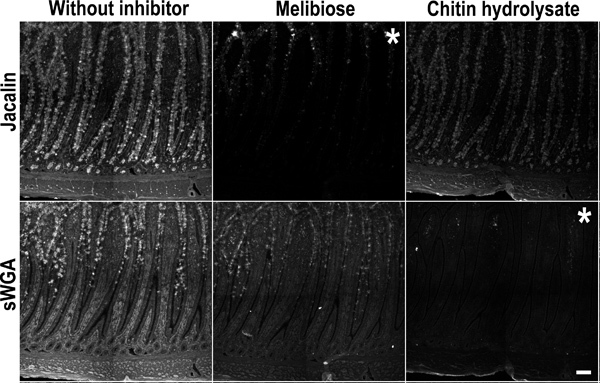 (right) Chitin-hydrolysate did not inhibit Jacalin staining. Lower panel: (left) sWGA staining without inhibitor. (center) Melibiose did not inhibit sWGA staining. (right) sWGA staining was inhibited by Chitin-hydrolysate. This inhibition confirms the specific interaction of lectins with the tissues. Asterisks mark image of staining inhibition. Scale bar indicates 100 μm. Figure 6. Detection of secretory mucins, glycolipids and glycan epitopes in frozen human colorectal cancer tissues. Colorectal cancer biopsies from villous carcinoma and mucous carcinoma were snap-frozen in liquid nitrogen and embedded in OCT. Tissue sections were incubated for 1 h with antibodies against the secreted mucin MUC5AC, sialyl Lewis a - glycan epitope found on gangliosides (colorectal cancer marker CA 19-9), and sialyl-Tn - abundant glycan epitope on mucins (detected with TKH2 antibody), followed by 30 min incubation with biotinylated donkey anti-mouse IgG secondary antibody, and 30 min incubation with peroxidase-conjugated streptavidin. Additional tissues were incubated for 1 hr with the biotinylated lectins SNA and sWGA, followed by 30 min incubation with peroxidase-conjugated streptavidin. Peroxidase staining was developed using AEC kit. Black scale bar indicates 200 μm. Preservation of mucus and glycan epitopes in frozen tissues is superior to that of tissues that were embedded in paraffin. We demonstrated the preservation of secreted mucus layer (Figures 1 and 3) and the distribution of three glycans structures (Figure 3) in frozen tissues compared with paraffin-embedded tissues. Specialized fixatives, such as Carnoy's solution (60% ethanol, 30% chloroform, 10% acetic acid)17 have been developed for optimal preservation of the mucus layer in tissue samples. Optimally, this solution should be used to collect tissue samples that are dedicated for mucus studies and was shown to preserve the smooth appearance of mucus layer16-17. The mucus layer in unfixed frozen samples embedded in OCT appears rugged and in some areas may detach from the tissue, however the overall layer thickness is in agreement with that observed in tissues that were fixed with Carnoy's solution and embedded in paraffin16-17. For example, the mucus layer in frozen human colon tissue section is ~100 μm (Figure 1), which is within the range reported for Carnoy's-fixed human colon sample 55.4±2.5 μm (range 7.7 - 204.8 μm) 16. It has been known for decades that ethanol dehydration results in ~30% shrinkage of biological samples18, and that organic solvents such as xylene, Citrisolv and chloroform extract lipids, glycolipids and, to some extent, proteins from the tissues13. Tissue processing for paraffin embedding includes the following steps: fixation (10% buffered formalin), dehydration (increasing ethanol concentration), and clearing (Citrisolv or xylene). By mimicking these steps on unfixed frozen tissue sections, we demonstrated that Citrisolv extracts mucus from frozen tissue sections resulting in tissue morphology that is similar to that of paraffin-embedded tissues (Figure 2, right panel). 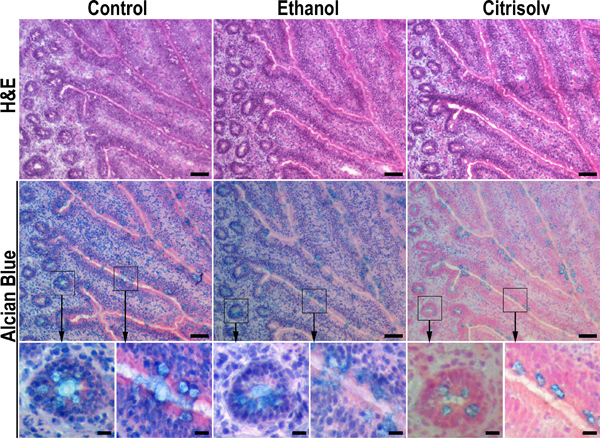 In contrast, the mucus layer was not altered by incubation with formalin or ethanol (Figure 2, left and center panels). This suggests that the clearing step of standard paraffin embedding procedure, which requires prolonged incubation in Citrisolv/xylene, results in the collapse of the mucus layer. Formalin fixation does not damage the mucus layer and frozen tissues sections that were fixed with formalin can readily be stained with lectins and antibodies against glycans, glycolipids and proteins (Figures 2, 3 and 6). These effects may be negligible for the study of membrane-bound proteins and tissue pathology, but they are devastating for highly hydrated structures such as the secreted mucus layer. However histological studies of mucins are still conducted mostly with paraffin-embedded samples, in which the mucus layer preservation is suboptimal. In depth analyses of mucus layer composition such as the precise identity of secreted or membrane bound MUC glycoprotein combinations require specific antibodies and mass spectrometry for identification of the protein backbones. Preservation of the mucus layer is but the initial requirement for such studies. Many laboratories have tissue samples frozen in OCT that were collected in the past for different projects, these tissues can be readily used to study mucins, glycolipids and glycan distribution eliminating the need to collect tissues into special fixatives that are designed uniquely for mucus preservation. Frozen tissues undergo minimal processing and therefore the natural distribution of glycans, which are hydrated in nature, is preserved. This is especially important in the realm of microbial-host interactions. Knowledge of naturalistic distribution and abundance of secreted mucins and the many glycan structures decorating these "barrier" molecules will be key in understanding host defense, microbial exploitation and pathogenesis. The authors would like to thank Nicole M. Nemeth (University of Georgia) and Jeanne M. Fair (LANL) for their help in harvesting chicken tissues, and Steven A. Springer for his help during filming. The care of all birds in this study was in compliance with National Institutes of Health guidelines for the humane use of laboratory animals and all protocols were approved by the Institutional Animal Care and Use Committees at Los Alamos National Security, LLC, operator of the Los Alamos National Laboratory under Contract No. DE-AC52-06NA25396 with the U.S. Department of Energy. The care of mice in this study is in compliance with UCSD animal approved protocol. Human tissues were obtained as part of UCSD approved IRB protocol. This work was supported by grant 118645 from University of California Lab Fee President Program (P.G.) and grant NS047101 from National Institute of Neurological Disorders and Stroke (Neuroscience Microscopy Shared Facility, UC San Diego). Slayter, H. S., Wold, J. K., Midtvedt, T. Intestinal mucin of germ-free rats. Biochemical and electron-microscopic characterization. Carbohydr. Res. 222, 1-9 (1991). Lamblin, G. The carbohydrate diversity of human respiratory mucins: a protection of the underlying mucosa. Am. Rev. Respir. Dis. 144, S19-S24 (1991). Corfield, A. P., Carroll, D., Myerscough, N., Probert, C. S. Mucins in the gastrointestinal tract in health and disease. Front. Biosci. 6, D1321-D1357 (2001). Turner, J. R. Intestinal mucosal barrier function in health and disease. Nat. Rev. Immunol. 9, 799-809 (2009). Lievin-Le Moal, V., Servin, A. L. The front line of enteric host defense against unwelcome intrusion of harmful microorganisms: mucins, antimicrobial peptides, and microbiota. Clin. Microbiol. Rev. 19, 315-337 (2006). Kim, Y. S., Ho, S. B. Intestinal goblet cells and mucins in health and disease: recent insights and progress. Curr. Gastroenterol. Rep. 12, 319-330 (2010). Nochi, T., Kiyono, H. Innate immunity in the mucosal immune system. Curr. Pharm. Des. 12, 4203-4213 (2006). Vareille, M., Kieninger, E., Edwards, M. R., Regamey, N. The airway epithelium: soldier in the fight against respiratory viruses. Clin. Microbiol. Rev. 24, 210-229 (2011). McGuckin, M. A., Linden, S. K., Sutton, P., Florin, T. H. Mucin dynamics and enteric pathogens. Nat. Rev. Microbiol. 9, 265-278 (2011). Knowles, M. R., Boucher, R. C. Mucus clearance as a primary innate defense mechanism for mammalian airways. J. Clin. Invest. 109, 571-577 (2002). Johansson, M. E. The inner of the two Muc2 mucin-dependent mucus layers in colon is devoid of bacteria. Proc. Natl. Acad. Sci. U.S.A. 105, 15064-15069 (2008). Hooper, L. V., Macpherson, A. J. Immune adaptations that maintain homeostasis with the intestinal microbiota. Nat. Rev. Immunol. 10, 159-169 (2010). Hayat, M. A. Microscopy, Immunohistochemistry, and Antigen Retrieval Methods: For Light and Electron Microscopy. Hayat, M. A. Kluwer Academic/Plenum Publishers. New York, NY. 53-70 (2002). Cohen, M., Hurtado-Ziola, N., Varki, A. ABO blood group glycans modulate sialic acid recognition on erythrocytes. Blood. 114, 3668-3676 (2009). Cohen, M., Varki, A. The sialome--far more than the sum of its parts. OMICS. 14, 455-464 (2010). Ota, H., Katsuyama, T. Alternating laminated array of two types of mucin in the human gastric surface mucous later. Histochemical J. 24, 86-92 (1992). Matsuo, K., Ota, H., Akamatsu, T., Sugiyama, A., Katsuyama, T. Histochemistry of the surface mucous gel layer of the human colon. Gut. 40, 782-789 (1997). Boyde, A., Maconnachie, E. Treatment with lithium salts reduces ethanol dehydration shrinkage of glutaraldehyde fixed tissue. Histochemistry. 66, 181-187 (1980).